Analysis shows, iPhone 5S gets quad-core graphics. The 5S is the first iPhone to pack quad-core graphics silicon. This gives the 64-bit chip plenty of horsepower for games. The 64-bit iPhone 5S boasts a quad-core graphics processing unit — a first for an iPhone. 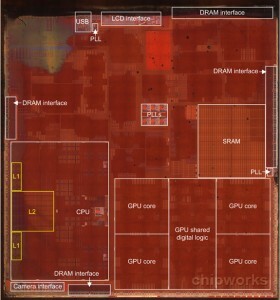 The A6 chip in the iPhone 5 had a three-core GPU. While core counts aren’t necessarily the deciding factor in making a chip fast, there is a trend toward adding more cores to boost performance. Samsung and Qualcomm, for instance, have had quad-core graphics for a while now. As have Apple’s higher-performance A5X and A6X chips that are used in the iPad 3 and iPad 4. And getting quad-core graphics into a phone undoubtedly helps games like Infinity Blade 3 run faster. Now we come to the central processing unit, or CPU. In this case, Apple is bucking a trend. 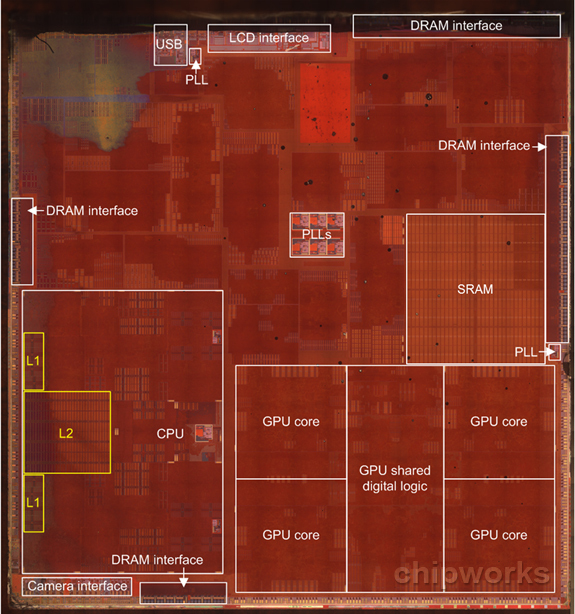 The Chipworks layout confirms earlier reports that the A7 has a dual-core CPU. Quad-core CPUs are increasingly common now, if not standard. That said, the proof is in the pudding: Apple’s A7 has impressive benchmarks. The iPhone 5S is anything but slow. Apple’s the first 64-bit ARM chip for smartphones?